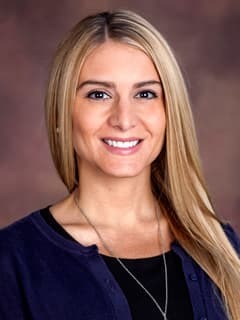 Elisha Pavlick, RD, CSP, LDN, is a clinical dietitian in the Division of Nephrology, the Pediatric Kidney Stone Center, and the Kidney Transplant and Dialysis Program at Children's Hospital of Philadelphia. Foster N, Rampolla E, Amaral S. CHOPed: Mastering the Art of the Renal Diet [abstract]. Hemodialysis International. 2016;20:173. Windt K, Pavlick E, Richards C. The Child with Kidney Disease. In: Contemporary Nephrology Nursing, Third Edition. Pitman, NJ: American Nephrology Nurses Association; 2017:573-596. Kakajiwala A, Jemielita T, Copelovitch L, Leonard MB, York A, Benton M, Hoofnagle A, Windt K, Merrigan K, Lederman A, Rampolla E, Denburg MR. Variability in Measures of Mineral Metabolism in Children on Hemodialysis: Impact on Clinical Decision-Making. Poster presented at: Annual American Society of Pediatric Nephrology Meeting; April 30 -May 3, 2016; Baltimore, MD. Foster N, Rampolla E, Amaral S. CHOPed: Mastering the Art of the Renal Diet. Poster presented at: Annual Dialysis Conference; February 2016; Seattle, WA. Kakajiwala A, Rampolla E, Pradhan M. Acute Hypocalcemia and Metabolic Alkalosis in Children on Cation-Exchange Resin Therapy. Poster presented at: Annual Dialysis Conference; February 2015; New Orleans, LA. Pavlick E. Vitamin D and Pediatric Chronic Kidney Disease. Lecture presented at: The Children’s Hospital of Philadelphia Nutrition Center and Integrated Health Seminar Series; November 30, 2016; Philadelphia, PA.
Rampolla E. Vitamin D and Pediatric Chronic Kidney Disease. Lecture presented at: Tri- State Dietitians Association; June 9, 2016; East Norriton, PA.
Rampolla E. Vitamin D and Pediatric Chronic Kidney Disease. Lecture presented at: 3rd Annual American Society of Pediatric Nephrology Multidisciplinary Symposium; October 1-2, 2015; New York, NY.